Social media is everywhere these days, so it’s imperative that your website has the ability to link your social media platforms on the site. This makes it easier for users on your website to follow your social platforms and allows you to easily make your content seen on your site. But with so many different social share plugins for WordPress, it can be quite overwhelming trying to figure out which one to choose. Of course, you’ll want to choose the best one and the easiest one to install, but you might feel lost if you don’t know what to look for in a quality WordPress social media plugin. Honestly, the main problem many have is performance. Since many of these plugins have to load extra stylesheets and scripts, you’ll see a difference in how slow your site might load. Because of this, you’ll need to find a balance between performance of your site and features. If you choose a social share plugin with loads of features, it might be great, but it will also most likely slow down your site and affect user experience. Next, you’ll need to decide which social networks you’ll want featured more prominently on your site. Fewer options can reduce all the clutter and provide a better user experience overall. 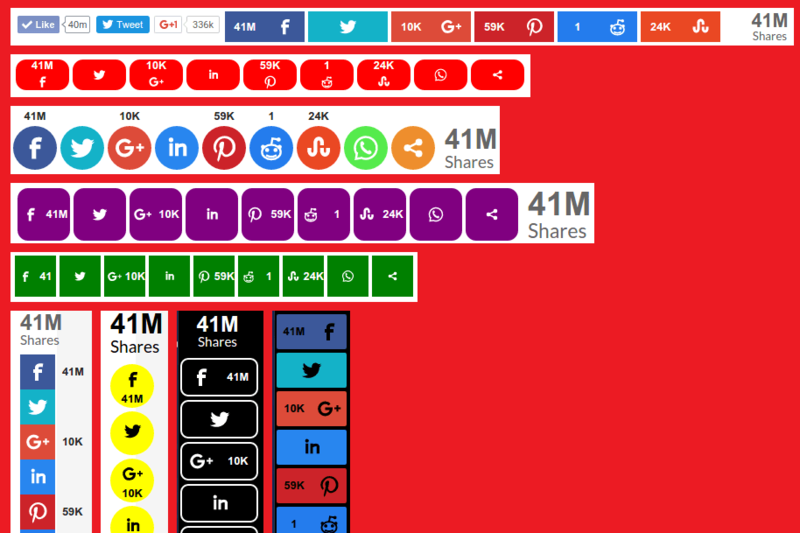 A WordPress social sharing which let’s you add share icons for RSS, Email, Facebook, Twitter, LinkedIn, Google+, Pinterest, Instagram, Youtube, ‘Share’ (covering 200+ other social media platforms) and upload custom share icons of your choice. Select from many other customization features for your social media icons! The WordPress Share Buttons Plugin from AddThis makes it easier than ever for your audience to spread your content around the web. The Plugin lets you connect to over 200 social channels including Messenger, WhatsApp, Facebook, Twitter, Pinterest and many more. Get more social shares which can lead to more website traffic with the best WordPress social sharing plugin! Built by a group of social media marketing experts and world class developers who are obsessed with performance. 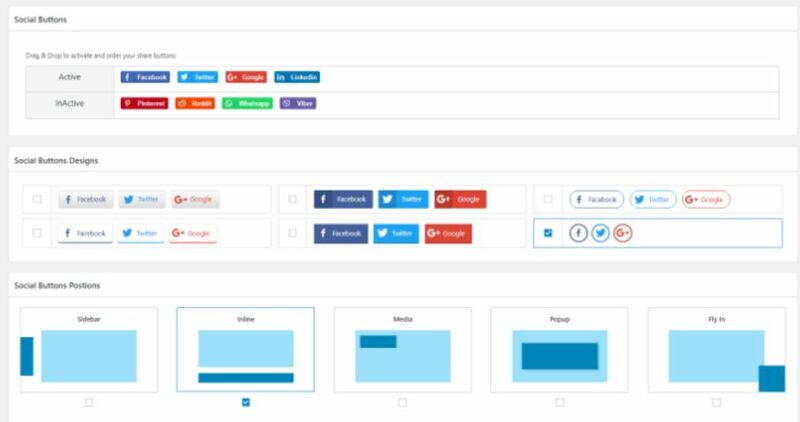 A free Social Media Plugin, professional and highly customizable plugin for social media sharing and optimizing of your valuable content. Social Pug is one of the easies to use social sharing plugin available. It let’s you add highly customizable social share buttons that will integrate beautifully with your website’s design, leading to increased interactions and social media shares. For each social media platform you can customize the social share button to your liking. You can choose to have a simple social media icon share button, a share button with a bold label to catch the eye and even social sharing buttons with social share counts, so that you visitors have social media proof. You can place the social sharing buttons before and after the post content or have them follow your readers as they scroll up and down the page, in the form of a social media floating sidebar. Beautifully designed 5 themes to select from. Major 6 social media included (Facebook, Twitter, Google+, Pinterest, LinkedIn and Digg). Sharing your social media networks on your site is important and something every site should feature. To make things easier for you, there is an abundance of social share WordPress plugins to choose from. However, some are better than others and hopefully you’ll find that my list made choosing the best one easier! But remember, just make sure the one you chose works with your site and doesn’t interfere with the users’ experience! 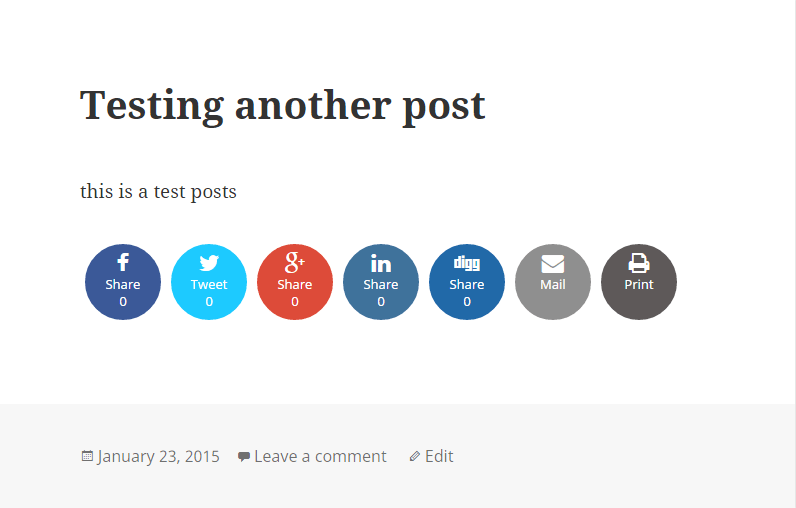 To view more social sharing plugins, check out our Social Media WordPress plugins.